Found 12 file extension associations related to Street Atlas USA and 12 file formats developed specifically for use with Street Atlas USA. Street Atlas USA contains the DeLorme produced and managed United States and Canadian street-level network, as well as highways and major roads for Mexico. It allows you to import your own data from text, Excel, Outlook, and other sources. The GPS Leader has innovative features - voice commands, spoken directions, automatic back-on-track re-routing with off-route distance settings, mobile map colors, and much more. 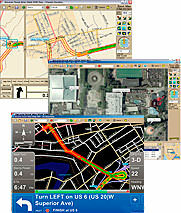 The Street Atlas USA software seems to be old or discontinued. If you need more information please contact the developers of Street Atlas USA (DeLorme), or check out their product website.